My 13 year old daughter is learning to cake decorate, this was the cake she made for our Halloween party. I think she did an awesome job, don't you? 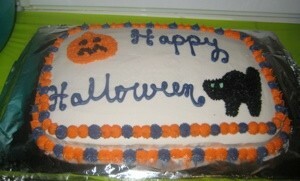 Please tell your daughter that she did a beautiful job on the Halloween cake. I am a cake decorator at a local grocery store and I think she did great! Tell her she has 'the talent' for it! Good Job! Debbie, your daughter did an outstanding job on the cake. If she is this good at 13, imagine what she'll be like as an adult! Congratulations on having such a talented child.